Emporia, Kansas, collection of the Helen F. Spencer Museum of Art. Rose Good Kretsinger created some of the most remarkable 20th-century quilts. I've been working on patterns for friends and students for several years interpreting her designs. I am crazy about iris in all their varieties so I adapted the Orchid Wreath into an Iris Wreath. 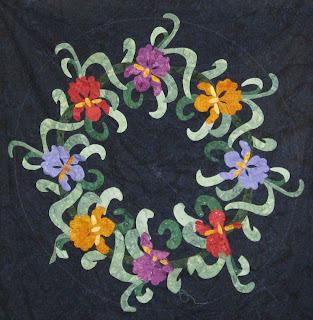 For her Iris Wreath Lori Kukuk used the pattern that's in my book Making History: Quilts and Fabrics from 1890-1970. She machine quilted it with her typical amazing quilting. Ilyse Moore is working on a version on a black background. 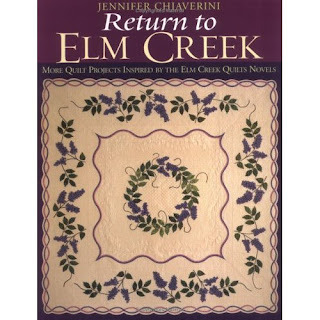 Here's another interpetation of the Orchid Wreath using lilacs on the cover of Jennifer Chiaverini's book. I blogged about Rose Kretsinger a few months ago and someone asked where they could read more about her. At the bottom of this posting is a bibliography of print and online sources. Here's the blog posting about her Antique Rose quilt. Carrie Hall and Rose Kretsinger, The Romance of the Patchwork Quilt (Caldwell, Idaho: Caxton Printers, 1935) Read her chapter on quilting for her ideas and designs. 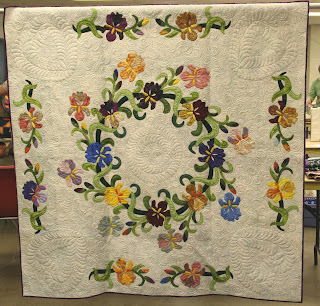 Jonathan Gregory, "The Joy of Beauty: The Creative Life and Quilts of Rose Kretsinger," Uncoverings 2007 (Vol. 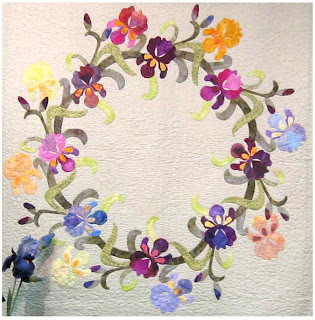 28) from the American Quilt Study Group. Click here to buy a copy of that issue. "Emporia 1925-1950: Reflections on a Community"
Quilters Hall of Fame, Editors Merikay Waldvogel & Rosalind Webster Perry. Chapter by Barbara Brackman---"Rose Kretsinger"
And read more about my book Making History with the Iris Wreath pattern by clicking here. 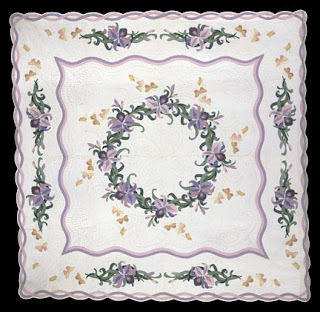 Scroll way down to the bottom of the page and click on the Google book preview to read the first chapter on late 19th century quilts. Thank you for this information. I have read some of these articles, now I have more to find. I hope someday to get to the Spencer Museum, and I hope at least some of her quilts are on display. I would really like to see the originals, up close. I have seen Rose Kretsinger's work online before and it is beautiful. But I like your adaptation better than the original and now I need to get your Making History so I can have the pattern! I also prefer iris to orchids so I'm glad you made the change. I love to learn about the quilts and the books about them. I always check on the library telus system. The libraries usually carry the history of quilt type books, so fun to peruse them. Barbara - Thanks for the info and glorious images. The Wild Iris is Tennessee's state flower. Now I will make sure to buy your book to get the wonderful pattern ;). Keep up the good work. Always informative and interesting.